Social media can be an incredibly powerful tool for communicating with a range of stakeholders, on a one-to-one or one-to-many basis. The challenges of social media are precisely this unencumbered direct access between companies and employees and the organisation’s public. Why Employ a Social Media Strategy? Developing a cohesive Social Media Strategy is instrumental in protecting the business’s reputation, communicating aligned brand messaging and ensuring all external communications operate cohesively with other organisation strategies (such as Business Development and Marketing strategies). A Social Media Strategy ensures that all activity, no matter how small, builds to support the organisation’s long-term objectives and over-arching vision. The organisation should consider the Strategy as a road map for activity, instilling confidence in everyone from the Marketing team through to board level that the organisation has a robust approach and process for communicating via social media. 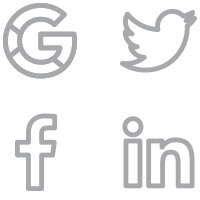 Organic social media (that excludes paid adverts) offers professional services more than a new advertising channel; it can be a valuable resource for business development, lead generation, networking, service feedback and publicity. Our Social Media Strategies can be used to complement existing communication or marketing strategy for the longer-term, or deployed on a campaign basis, used to communicate clear messaging about a new product/service for example. Our “Think. Share. Grow.” process guides you through the strategic planning, execution, monitoring and evaluation of your social media activities. By auditing your existing efforts we are able to identify potential risks and opportunities, as well as make the business case for the social media channels that are most beneficial for your business sector and objectives. Social media connects a digital audience to your business which exists on digital platforms and in the ‘real world’, so Luminescence Social Media Strategies take an ‘omni-channel’ approach – considering the ways your firm can embed social media processes into its existing ‘real world’ activity such as networking and events. Each strategy is developed in collaboration with your team, tailored to address your business’s specific challenges and tailored to your firm’s specific compliance requirements. Typically, this requires 2-3 consultation meetings. The typical strategy we produce is designed to empower your internal team to deliver the communication campaign over a 12-month period. All of our strategy work utilises the SMART(ER)* planning framework, ensuring measurable business outcomes, not just activity outputs. Luminescence has also adopted the Integrated Evaluation Framework from AMEC, the international association for the measurement and evaluation of communication, ensuring our campaigns are held to stringent, industry-leading quality standards. As members of the CIPR, we are accountable to its Code of Conduct and to develop and demonstrate ethical competence. *Specific, Measurable, Assignable, Realistic, Time-bound, Evaluated and Reviewed. Combining stringent measurement and evaluation processes – working with your internal team to develop more efficient workflow processes and skills where required – a Social Media Strategy from Luminescence engages your most important stakeholders over time, with consistent and steady content that they value, using the latest media tactics and drives positive action. To deliver successes with tangible results, it is crucial that Social Media activity is tied to your organisational goals. Get in touch to find out more about our Social Media Strategies and how Luminescence can strengthen your organisation.